Up until a week ago I thought I hated orzo. I had a valid reason though, there was this one time when I had a bad experience. All I’ll say about said experience is plane food. I think it’s pretty self explanatory, but plane food is usually rather revolting, and orzo on a plane might just be the grossest meal I’ve ever had. Shudder. What was it then, you ask, that made me decide to try orzo again? A little something called The Secret Recipe Club. Which is a wonderful take on the idea of a recipe exchange, except it’s all done in secret and revealed on the reveal day, which is today! This month I was assigned the blog The Jey of Cooking a wonderful, cleverly named blog written by Jey. 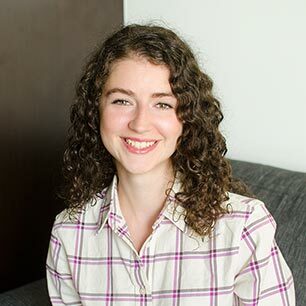 Not only is she hilarious, as seen in a recent post where she talks about how her love of garlic means that she is most definitely not a vampire, but her blog is chock-full of delicious, simple and healthy recipes. I perused her archives, spending hours going all the way back to her very first post to decide what I wanted to make. I stumbled upon this recipe for Garlic Parmesan Orzo and was completely smitten when I read the list of ingredients, garlic, parmesan and spinach – a winning combination, the only issue, orzo. I conquered my fear and am so glad that I did so, this recipe for garlic parmesan orzo will blow. your. mind. It’s one of my new favourite recipes and I can’t wait to make it again. Cook orzo, following the directions on the package. In a large pan, melt butter over medium-low heat. Add garlic, cooking for 4 minutes, or until tender. Turn off the heat and add the chopped spinach and cook for a minute, allowing to wilt. Next add the Parmesan, orzo, milk, salt and pepper. Allowing the cheese to melt into the orzo. What I love about this recipe is not only does it taste heavenly but it is also extremely simple to make. After eating this orzo, I can definitely say that I am no longer a hater of all things orzo. Hi Lou, I'm so glad that reveal day is here. I just wanted to say that I've had a blast going through your blog. There are so many recipes that I want to try. I'm glad I was assigned your blog this month. The Orzo looks delicious. And you bet the garlic, parmesan and spinach is a great combo. My sister makes an orzo pasta similar to this and she puts chicken in hers. This is something I need to make soon. Great to discover your blog through SRC! Yum! This looks like a great orzo recipe! Good pick! This looks and sounds delicious. I love these flavors together. So glad you liked it and that you conquered your fear!! I think anytime you try a food for the first time on a plane it leads to a bad experience. Yum!!! 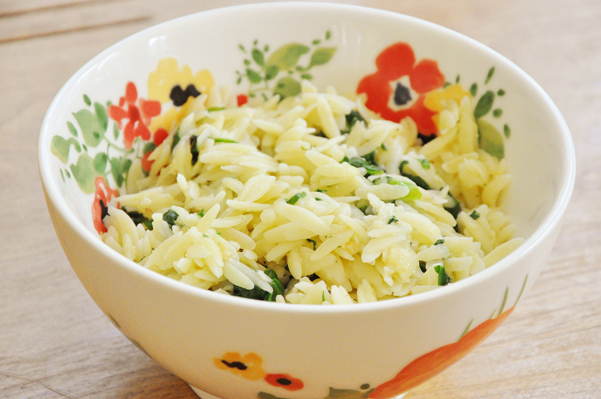 I have a whole pound of orzo in my pantry and now I'm dying to try this recipe! Holy yum! This looks delicious and so simple! I actually made this today for dinner, and it was delicious! Thank you for sharing this recipe at the exact right time. It is definitely a "make again" dish! I love orzo. I use it in place of rice in many dishes! My fiancee had a bad experience with orzo too and thinks he doesn't like it. I bet this recipe would change his mind! Great SRC pick! I shall definitely be making this dish...It looks soooo delicious...All of your recipes are easy to prepare & very "yummy"....Bonus! Ooooo! This sounds delicious, next chicken dinner night this will be on the side for sure. I've never had orzo before but this recipe has me ready to try it. What a great sounding side dish. This Garlic Parmesan Orzo would make the perfect side item!! OR even a meal! !